as God in Christ forgave you." Today we are covering Chapter 4 of The Most Important Place on Earth. You can still join along with us and can find the book HERE. It has been fairly busy here on the homefront so this post will be short and sweet one (I promise, the next one will be longer) but one that is important nonetheless. 1. FORGIVENESS -We need to teach our children to ask for forgiveness and we need to be humble enough to ask for it as well (after all, we are sinners and we will mess up! We need to be the first examples of "I'm sorry, I was wrong. Will you forgive me?" It might be hard a first, but after a while it get's easier. I promise! 2. REPENTANCE - Teaching our children to turn away from their sin after they get forgiveness is just as important as well and for us adults too! 3.GRATITUDE - I have been thinking about gratitude lately. In fact, the more I think of it, the more I am convinced I need to have more of it. Especially in the little things like--did I wake up today? Did I have water, food, clothing, electricity at my finger tips? Am I able to get up and around? Then God has a plan for me like Mr. Wolgemuth states and for all these things mentioned we need to be thankful. I think sometimes, we Americans have so much that we truly can take it all for granted and have an attitude that everything is owed to us when it is not. We need to thank the Lord for every little thing because it is indeed a gift. And we can teach our family gratefulness as well. 4.TENDERNESS - Tenderness is a purposeful act. Sometimes we forget and can act harshly towards one another. "We've talked about repentance and forgiveness as examples of grace, but Paul also encouraged us to be "tenderhearted." Literally the word means "to smear with inward affection." Isn't that a great word picture?" Tenderness is not something that comes natural to all of us. "Tenderness is a quality you prepare before your're with your spouse and your children. Ahead of time, affirm the things you love about the people in your home. Preplay a gentle embrace and tender words for each one. How could I be so lucky? you think. Then when your actually with your family, the presentation matches what you've prepared. Even when circumstances call for toughness, your spirit is one of loving discipline and not one of anger or revenge. " 5. GENEROSITY - More is caught than taught when it comes to this. If the children are taught to be generous and share their toys, they will begin to learn a more generous spirit. If we, as the parents, are examples in giving, our children will learn from our example. 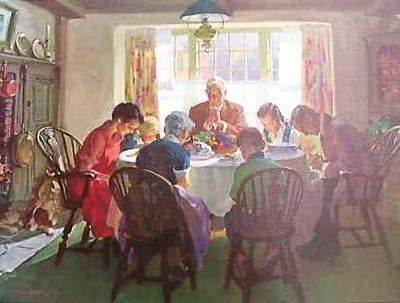 If a father is always giving at his church and a mother is opening the door to her home the children will see it. Especially it being modeled year after year. Dear Lord, please help us to model these five graces of forgiveness, repentance, gratitude, tenderness, and generosity. We need help and can't do it on our own. Thank you for what you are doing in our hearts and our lives. Thank you for our family and help us to lead them to You and not hinder them from coming to You. In Jesus' Name, we pray. Amen. If you are joining us for the first time, we are going through this book for the next few weeks and would love to have you join us! 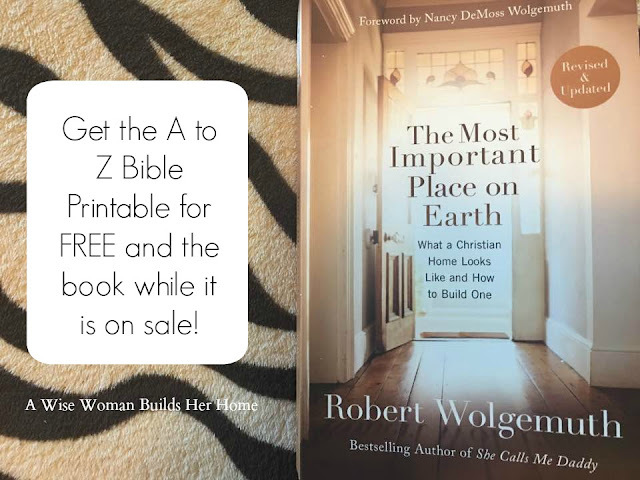 We will cover a chapter a week and in case you missed it be sure to watch the video and get the A-to Z Bible Verse Printable to do with your children (we'll be doing it too). The book is still on sale so it is a great time to get it!